10 Things To Be Thankful For This Thanksgiving Day. It’s easy to look back and think what we should have done or how we should have reacted in certain situations such as Thanksgiving day. Let’s look around more and see the real beauty that surrounds us. Simple things such as getting up in the morning, being able to see, hear, walk, love, and be loved, being able to be called a child of God even when we didn’t deserve it, are all things to be thankful for. Let’s not forget that our Lord Jesus gave Himself for us. Without His amazing grace, we wouldn’t be saved from our sins! 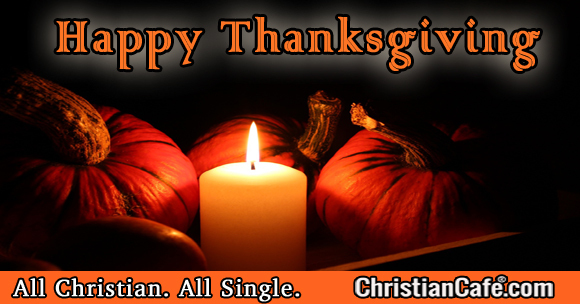 Thanksgiving and its meaning for Christian singles. Thanksgiving should be a daily response of any Christian. 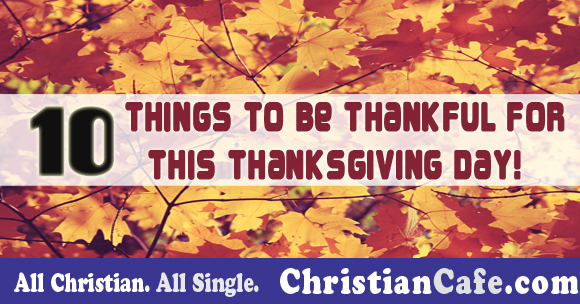 This year’s message for our Christian singles friends is centered on thanksgiving, blessing, grace, and sacrifice. Remember to praise the Lord, even in our darkest hours, for all that He has done, is doing, and will do for us. ; He is in charge, no matter how lonely we may feel, at times! Let this Thanksgiving be a happy and a thankful one, no matter our circumstances. As Thanksgiving nears, we should take some time to praise God for all the good thing He has done for each of us. Like Christmas, Thanksgiving can be a difficult time for Christian singles to celebrate, as they feel “alone” even when they are gathered with family or friends. We should thank God by also helping others to celebrate this great occasion, by gathering with family and friends, be they married or single, so even if this doesn’t mean much for you it can mean a great deal for someone else who is feeling lonely at this time.